Bangladesh 2-135 (Mohammad Ashraful 65, Mominul Haque 35*, Shaminda Eranga 1-25) trails Sri Lanka 4-570 declared (Lahiru Thirimanne 155*, Kumar Sangakkara 142, Dinesh Chandimal 116*, Sohag Gazi 3-164) by 435 runs. 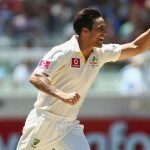 The Islanders piled up 570 runs for the loss of just four wickets in 135 overs at a net run rate of 4.22 per over. The Bengal Tigers responded well and scored 135 runs with 8 wickets in hand while utilising 43 overs. The second day’s play came to an end on Saturday, March 9, 2013, at Galle International Stadium. Earlier, the hosts started the day at 3-361 in 85.3 overs whereas Lahiru Thirimanne and Angelo Mathews were at the crease with 74 and 25 runs accordingly. The visitors got an early breakthrough when Mathews was caught and bowled by Abul Hasan for 27 after the addition of just six runs to the total. 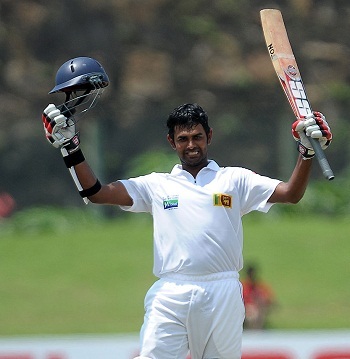 Dinesh Chandimal got together with Thirimanne and opened his account with a boundary on the very first ball he faced. The hosts got only 16 runs until the end of the 95th over as Chandimal was dropped at just five runs off Abul Hasan on the fifth ball of the next over. The duo found it hard to hit the boundaries as Chandimal was again dropped at 8 runs by Abul Hasan at fine leg off Shahadat Hossain in the 102nd over. The long awaited four was scored two overs later and Chandimal added another two in the next over. Dinesh Chandimal was the most attacking of the two and the boundaries were flourishing from his bat at regular intervals. Lahiru Thirimanne smashed his maiden Test hundred in the 113rd over as Chandimal got his fifty three overs later with a four. The latter hit the first six of the day in the 120th over as Thirimanne kept on cruising from his end. Dinesh Chandimal speeded up the scoring rate and cracked his maiden Hundred as well on the fourth delivery of the 129th over. He was once again dropped at 111 by Mahmudullah off Sohag Gazi in the 132nd over. Chandimal remained unbeaten at 116 off 151 balls with 2 big sixes and 12 fours whereas Lahiru Thirimanne secured his end with 155 from 256 with 14 fours as the skipper of Sri Lanka, Angelo Mathews, declared the innings at 570 with six wickets still remaining. Sohag Gazi was the most successful bowler with three wickets whereas Abul Hasan claimed one. Bangladesh opened the innings with Jahurul Islam along with Anamul Haque as the first took off with a four on the very first ball of the innings. Jahurul Islam added 3 fours in the following three overs and became the first victim at 23 after scoring 20 runs. Mohammad Ashraful joined in next with Anamul Haque and they both started consolidating the innings. They remained watchful, they kept the score board ticking and reached 65 in 24 overs when Anamul Haque was clean bowled by Ajantha Mendis for 13 runs. Mominul Haque walked in next as Mohammad Ashraful hit 2 back to back fours in the 26th over and completed his 9th Test half century on the last ball of the 30th over. The first hundred of the innings was displayed on board in the 32nd over as Mominul added 3 fours in the next 2 overs and remained at the crease for 35 at the end of the day’s play. Mohammad Ashraful was at the other end with 65 as the tourists scored 135 in 43 overs for the loss of two wickets. Bangladesh is still not out of trouble and needs some solid batting from the batsmen at the crease and a few more to follow. Sri Lanka will try to get few early wickets on day three to put more pressure on the rival team and get a favourable result.